(Nanowerk News) Tucked away in a small research park near NASA's Langley Research Center, the outside of the modern building looks pretty much like any new office. But just on the other side of the glass and concrete walls, there is a nanotechnology research facility buzzing with scientific and technological developments that promise to improve our world – and better equip us to visit other worlds. The NIA Research and Innovation Laboratories in Hampton is where National Institute of Aerospace Research Fellow Dr. Cheol Park, NASA's Dr. Catharine Fay and a team of nanotechnology experts from both renowned organizations are working together to create and enhance a groundbreaking ability to synthesize high quality samples of boron nitride nanotubes, also known as BNNT. First theorized in 1994 by researchers at UC Berkley, BNNT represents a new class of materials. Super-strong textile-like nanotubes with the appearance of cotton, the material has a molecular backbone 100 times stronger than steel. Boron Nitride Nanotubes are as strong as the better-known carbon nanotubes, but much more heat resistant - up to 800° C or 1472° F in air. The material also has an intrinsic piezoelectric function -- meaning it creates electricity resulting from stretching or twisting. This and other characteristics of the multi-functional nanotube make the technology a prime candidate for applications ranging from heat shields for the next generation of spacecraft, to new water filtration capabilities - even potential cancer therapies. Cobweb-like white BNNT as grown for 10 seconds from the very first run. BNNT synthesis expertise has been developed through a collaboration between the National Institute of Aerospace, NASA’s Langley Research Center and Jefferson Labs – all based in Hampton Roads. First produced in 1995 at UC Berkley, high-quality BNNT material has been notoriously difficult to make because the synthesis process is completely different from carbon nanotubes. Even a year ago, you could literally hold the world's supply of synthesized high-quality BNNT material in one hand at the first generation NASA BNNT lab. This summer however, the scientists at NIA and NASA wrote a new chapter in the book of BNNT research. In July, Dr. Park and his colleagues turned on the new BNNT science rig in the NIA Research and Innovation Laboratories for its first test run. The new chamber features an extremely stable laser and can produce BNNT samples under pressures up to 1000 psi. 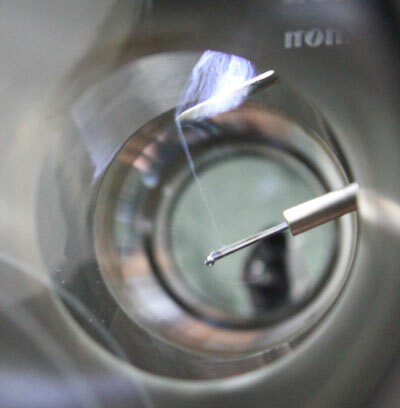 On the facility's initial run, the experimental setup produced beautiful, long, thin highly crystalline tubes that would remind the casual observer of cobwebs (see above image). "Even without optimization, it was very high quality material," remarked Dr. Park. "This new facility gives us a BNNT synthesis capability to produce very long, very small diameter nanotube fibers at a quality that is unmatched anywhere in the world." That's just the beginning for the laboratory's capabilities and for the future of BNNT applications. Researchers are now hard at work optimizing the equipment and the production process. The new custom built high pressure chamber has several ports to monitor and probe the synthesis process. “This in-situ diagnostic capability will help to understand the growth mechanisms of BNNT for the first time and may result in better control of the BNNT material production leading to large scale manufacturing of high quality BNNTs”, said Dr. Sivaram Arepalli, Vice President of Education and Outreach at NIA. The availability of high quality BNNT material is expected to have a significant impact on new products in the projected multi-billion-dollar nanotube applications market in the coming years. This recent research progress may well pave the way to innovative applications that improve life on earth and extend our capabilities to explore space.